This award recognizes exceptional rehabilitation projects in which a historic resource is adapted to meet the demands of modern use without compromising the site’s historic character. Projects demonstrate adherence to the Secretary of the Interior’s Standards for Rehabilitation, and offer creative solutions to rehabilitating historic places. In 1932, William Ward Watkin designed the building at 500 Fannin for the Wilson Stationery and Printing Company. Watkin’s “moderne-style” design for the building uses several unique formal strategies. The significant quantity of glass on the east and north faces is noticeable. These beautifully proportioned, non-uniform openings were glazed with industrial steel sash windows, many of them operable. The upper floors rested on a plinth of stone and “plate glass” windows. Regrettably, this formerly charming building, vacant since 1979, was in a state of significant disrepair when acquired in 2010 by 500 Fannin L.L.C. The new owners engaged Ziegler Cooper Architects to provide complete rehabilitation design services, with the intended result that the building be restored in complete conformance with the original Watkin design. Fretz Construction Company, a Houston-based contracting firm started in 1923, and which has a tremendous body of successful historic restoration work, was hired to perform this significant rehabilitation. The building’s significance is not just a result of William Ward Watkin’s unique Art Deco design, but in its prominent location on the corner of Fannin and Prairie. Prior to its rehabilitation, the blight of this deteriorated building on these well-traveled streets in the Historic District of Downtown Houston presented a less-than-favorable image for an area that had undergone significant restoration over the prior decade. Bringing this corner of Downtown Houston back to life by the renovation of this building, as well as saving it from probable destruction by neglect, is truly significant, and represents the validity and importance of historic restoration of our remaining important buildings. It was the intent of 500 Fannin L.L.C. to breathe new life into this long abandoned building, while adapting the space to accommodate current technological and spatial demands of Class A office space. To add to the complexity of the design and construction team’s charge, the intent was also to achieve LEED Gold Certification and complete the rehabilitation in complete conformance and strict adherence to the Secretary of the Interior’s Standards. ALL of these goals were achieved! Since completion, this project has been recognized by Preservation Houston with a Good Brick Award, an AIA Design Award, an Outstanding Construction Award by the AGC TBB, two Houston Business Journal Landmark Awards, an AGC Houston APEX Award, and it was selected by the Houston Chapter of the American Subcontractor’s Association as the 2012 Project of the Year. These accolades demonstrate the industry’s acknowledgement of the faithfulness of the rehabilitation as well as the importance of saving our historic structures. 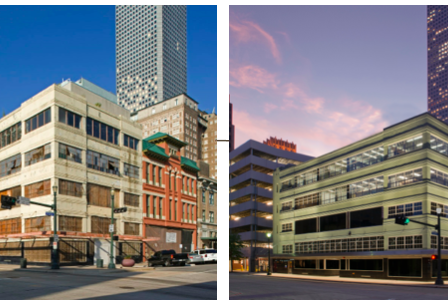 The most important result is that this beautiful, once-neglected building has been restored to new life, and stands as a beacon on this important corner of Fannin and Prairie Streets in the Historic District of Downtown Houston. It is a tribute to the abilities of William Ward Watkin in his original design, and the team of Ziegler Cooper Architects and Fretz Construction Company in their considerate restoration.